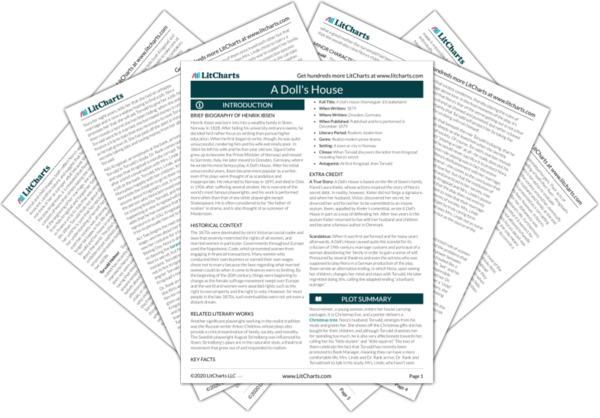 Instant downloads of all 942 LitChart PDFs (including A Doll's House). 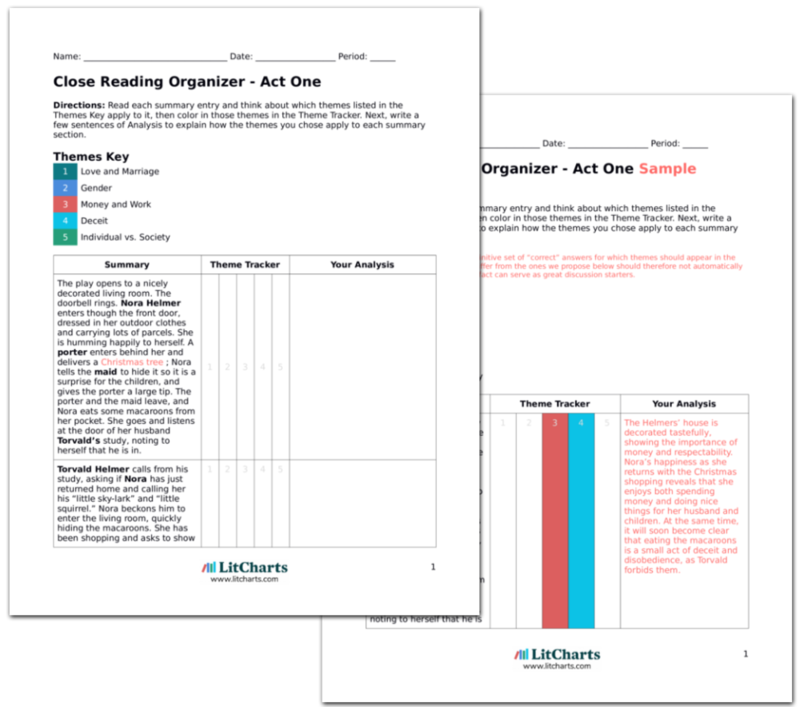 LitCharts assigns a color and icon to each theme in A Doll's House, which you can use to track the themes throughout the work. The play opens to a nicely decorated living room. The doorbell rings. Nora Helmer enters though the front door, dressed in her outdoor clothes and carrying lots of parcels. She is humming happily to herself. A porter enters behind her and delivers a Christmas tree ; Nora tells the maid to hide it so it is a surprise for the children, and gives the porter a large tip. The porter and the maid leave, and Nora eats some macaroons from her pocket. She goes and listens at the door of her husband Torvald’s study, noting to herself that he is in. The Helmers’ house is decorated tastefully, showing the importance of money and respectability. Nora’s happiness as she returns with the Christmas shopping reveals that she enjoys both spending money and doing nice things for her husband and children. At the same time, it will soon become clear that eating the macaroons is a small act of deceit and disobedience, as Torvald forbids them. Torvald Helmer calls from his study, asking if Nora has just returned home and calling her his “little sky-lark” and “little squirrel.” Nora beckons him to enter the living room, quickly hiding the macaroons. She has been shopping and asks to show Torvald what she has bought. Torvald gently scolds her for spending too much. Nora replies that now Torvald is earning a large salary they can afford to spend more at Christmas; however, Torvald argues that, because his first paycheck won’t come for three months, they must still be careful with money. Torvald’s nicknames for Nora suggest that he thinks of her almost as a child or a pet. This impression is emphasized when Nora hides the macaroons, like a mischievous child afraid of getting caught. Torvald’s parent-like attitude is highlighted by the gently scolding way he talks to Nora about money, implying that he thinks she's not intelligent enough to be financially responsible. This introduces the theme of debt and shows Nora and Torvald’s wildly different views on the subject. Torvald’s command, “never borrow!” is ironic because, as will be revealed, it's already too late. Nora concedes: “just as you say, Torvald.” Torvald, not wanting to see her sulk, gives her more money. She is thrilled and thanks him enthusiastically. Torvald’s rewards Nora for her obedience; his control of the money gives him power in the marriage, though Nora's obedience also allows her to manipulate him. And, of course, she has already borrowed money once, early in their marriage. So her obedience is somewhat shallow, and seems more a role she is playing, happily, than something she truly believes in. 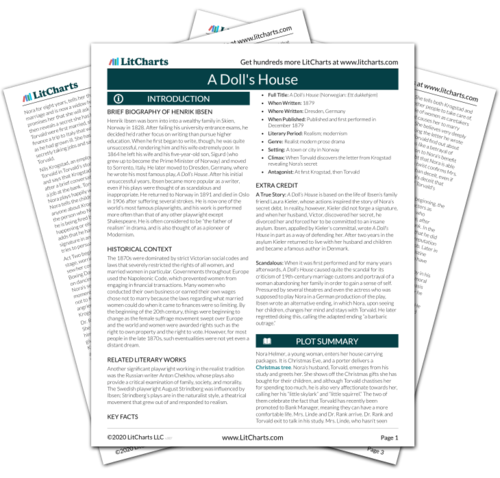 Get the entire A Doll's House LitChart as a printable PDF. Nora shows off the presents she has bought for the children (a doll for her daughter; a sword and a horse for the boys) and the maids, which she admits were cheap. She hides Torvald’s present for later. Torvald asks what she got for herself and Nora admits that she didn’t get anything. When Torvald asks what she wants she says she would simply like some money, so she can have longer to think about what she wants and buy herself something later on. Torvald calls her a “spendthrift” and claims that she is irresponsible with money, arguing that it is a trait inherited from her father. Christmas represents family, and Nora’s happiness shows she enjoys performing the role of a wife and mother. Her choice of toys suggests she buys into traditional gender roles: the girl must be a nurturing wife and mother, and the boys strong and powerful. At the same time, Nora's request for money to buy something for herself suggests she does want the ability to make decisions for herself. Torvald not entrusting Nora with the money for her own present demonstrates the imbalance of power in their marriage. Torvald says that Nora is looking guilty and asks several times if she went to the candy store. Nora lies and says she didn’t, saying she would “never dream of doing” anything Torvald did not want her to. Even though Torvald and Nora appear to be in love, Torvald does not trust her, and Nora’s sworn obedience is a lie; she was eating macaroons earlier. Torvald and Nora look forward to the evening, while recalling earlier Christmases when they didn’t have as much money and Nora had to make decorations herself. Torvald repeatedly expresses his happiness that those times are over now that he has a larger income. Money is central to Torvald and Nora’s happiness. Torvald’s emphasis on their new prosperity suggests how important money is to him as well. Dr. Rank and an unnamed lady arrive. Torvald says he does not want to receive visitors, but it is too late as Dr. Rank is already in his study. Meanwhile, the lady is waiting to see Nora. The guests are separated by gender, showing a gulf between the sexes. Torvald exits to meet Dr. Rank in his study, while the lady, wearing traveling clothes, is shown in to see Nora in the living room. The lady greets Nora, who at first doesn’t recognize her. Soon, however, Nora realizes it is Mrs. Linde. Nora remarks that Mrs. Linde has changed a great deal in the eight years since they last saw each other and tells her how happy she has been in the time that has passed. Nora is surprised and impressed that Mrs. Linde traveled to town in wintertime. She helps Mrs. Linde get comfortable and says that now Mrs. Linde looks like her old self again, only paler and thinner. Mrs. Linde notes that she is also a lot older. Nora interrupts the conversation and scolds herself for “chattering on” and remarks with sympathy that Mrs. Linde is now a widow. Mrs. Linde confirms that her husband died three years ago. Mrs. Linde has been visibly changed by her life experiences; meanwhile, Nora’s questioning is childlike. Nora’s happiness in the last eight years has left her remaining girlishly innocent and naïve, whereas Mrs. Linde seems much older. Mrs. Linde’s decision to travel alone was unusual for women at the time, and Nora’s admiration of her “courage” suggests a desire for independence. Mrs. Linde’s status as a widow adds to the impression that she is much older than Nora. Nora asks if Mrs. Linde’s husband left her any money or children, and Mrs. Linde confirms that she was left nothing, and that their marriage was loveless. Nora asks in disbelief if that is possible, and Mrs. Linde explains that it “sometimes happens.” Nora remarks how sad it is that Mrs. Linde is now completely alone, and tells Mrs. Linde about her own three children. This conversation shows the two sides to marriage: on the one hand, Nora’s marriage to Torvald seems to be full of love, happiness, and security. Yet Mrs. Linde’s marriage was unhappy and has left her alone and struggling to survive. Nora’s comment about her children is tactless, showing naiveté. In this part of the play Nora is childishly impolite. Mrs. Linde is obviously in a bad situation following the death of her husband, yet instead of listening to her Nora begins to insensitively boast about her and Torvald’s good fortune. Her speech also shows that she believes money leads to freedom and happiness. Mrs. Linde says she remembers Nora being a “spendthrift” in their school days, and Nora admits that Torvald still calls her that. However, she says that she is smarter than that, and explains that she couldn’t have spent a lot as they haven’t had much money, and that she and Torvald have both had to work. Mrs. Linde is surprised. Nora says she did “odd jobs” such as sewing, embroidery, “and one or two other things besides.” She says that after they got married Torvald worked so hard that he became very sick, and that the doctors said he had to travel South in order to get better. Torvald’s idea that Nora is irresponsible with money is here backed up by Mrs. Linde. However, the fact that Nora worked suggests that she is more responsible than others may think. It was rare at the time for middle class women like Nora to work, and the “one or two other things” she mentions is suspicious—suggesting that there is more to her story than meets the eye. This is true, of course, because she also borrowed money. Mrs. Linde says she knows that Nora and Torvald spent a year in Italy, and Nora explains that, although it saved Torvald’s life, it wasn’t easy to go because it cost so much money. Mrs. Linde notes that it was lucky they had the money given the circumstances, and Nora says that they got it from her father, who died around the time that they left. Nora explains that, because she was heavily pregnant and taking care of Torvald, who was sick, she was unable to look after her father in his final days, and that this was the saddest thing that had happened to her during her marriage. Immediately after Nora’s father’s death, they left for Italy, and by the time they returned Torvald was completely cured and healthy again. This passage shows the importance of money: not only does it afford freedom and comfort, but it saved Torvald’s life. Nora’s explanation that they borrowed the money is a lie, an act of deceit that no one knows about apart from Nora herself. However, the story of her father’s death also shows that she was putting others before herself: both Torvald and her son, who she was pregnant with. The fact that she took care of Torvald instead of her beloved father shows that her marriage was her priority above everything. Mrs. Linde asks about Dr. Rank, wondering if his visit means Torvald is still in bad health. Nora explains that Dr. Rank is her and Torvald’s best friend and that he visits once a day, and that she herself, Torvald, and their children are all perfectly healthy. She exclaims that she is so happy to be alive, before once again scolding herself for talking too much about herself. The way Nora delights in her own family’s health and good fortune in front of Mrs. Linde, whose husband has died and who is clearly struggling, is naïve and insensitive. She seems to be aware that it is impolite to talk so much about her own life, but is unable to stop herself. Nora asks if it is really true that Mrs. Linde did not love her husband, and why she married him. Mrs. Linde explains that she had to take care of her bedridden mother and two younger brothers and therefore felt she didn’t have a choice. She tells Nora that her husband had been wealthy, but following his death his business fell apart and thus she was left with nothing. She says that she has spent the last three years struggling to survive by opening a shop and running a school, but that this is now over as her mother has died and her brothers are working themselves. Mrs. Linde’s story shows how difficult it was for women to survive without the financial support of men. The need for money effectively forced her to marry her husband, and after his death her struggle to support her family highlights the obstacles women faced in earning a reasonable income. Indeed, both Nora and Mrs. Linde’s attempts to earn money were confined to work deemed appropriate for women—embroidery, working in a school, etc. Nora says Mrs. Linde must feel relieved, but Mrs. Linde says she feels empty and purposeless because she has “nobody to live for any more.” She says she wanted to move in order to find a steady job, maybe in an office. Nora says that that kind of work is exhausting and Mrs. Linde would be better off taking a holiday, to which Mrs. Linde replies that she doesn’t have a father she can fall back on for money. Mrs. Linde laments how easy it for someone in her position to become bitter and says she ends up only thinking about herself. She admits that she was happy to hear about Torvald’s promotion because she hopes that he will help her find a job. Both Nora and Mrs. Linde’s lives show that women were supposed to find a sense of purpose in serving others. Without a husband and family to take care of, Mrs. Linde feels empty and worries about being selfish. Mrs. Linde’s hope of working in an office shows a desire for independence not normally afforded to women. Nora’s comment that this would be “exhausting” suggests she believes that such work is not appropriate for women. Nora promises to help persuade Torvald to give Mrs. Linde a job. Mrs. Linde thanks her, saying Nora’s behavior is exceptionally kind considering Nora hasn’t had to struggle much herself. Nora is shocked by the accusation and says that she has had to put up with more than Mrs. Linde may realize. She says Mrs. Linde is just like everyone else who doesn’t think she is responsible enough to handle serious matters. She reveals that in everything she has told Mrs. Linde there is a “big thing” that she has concealed. Nora is clearly frustrated with not being taken seriously by others. Ironically, this frustration leads her to act rather irresponsibly, as she decides to tell Mrs. Linde the secret she has been concealing from everyone else. Nora mentions that Mrs. Linde is proud of having been able to look after her mother and brothers, and says that she too has something to be proud of. Before revealing what it is, Nora implores Mrs. Linde to be quiet and says that nobody must find out about it. She then explains that she was the one who saved Torvald’s life. Although everyone thinks that the money for the trip to Italy came from Nora’s father, Nora reveals that it was in fact she herself who raised it. Mrs. Linde is shocked and asks how it was possible, wondering if Nora won a sweepstake. Both Nora and Mrs. Linde find joy in being able to provide for their families; this is both an adherence to the traditional role of women as selfless nurturers and a rejection of the notion that women shouldn’t have financial independence. Nora’s revelation of the truth of how she got the money is a crucial turning point in the play; it is the first step in the total unraveling of her secret. Nora at first won’t reveal how she acquired the money, delighting in keeping Mrs. Linde in suspense. Mrs. Linde says it can’t be possible for Nora to have borrowed the money, because a woman cannot do that without her husband’s consent. Nora hints that if the woman has “a sense for business” it might be possible, but also says that she may or may not have borrowed it. She says that, considering how attractive she is, an admirer could have given it to her. Mrs. Linde chastises her for being silly. Nora’s joy in slowly and mysteriously revealing her secret suggests that she does not in fact take the matter that seriously, undermining her claim of being responsible. Mrs. Linde’s guesses at how she may have got the money show how limited the options were for women who wished to earn money independently of their husbands. Mrs. Linde, worried, asks if Nora has done something rash. Nora says that she saved her husband’s life, something that couldn’t be considered rash. Mrs. Linde replies that, regardless of circumstances, acting behind her husband’s back is a rash move. Nora explains that the “whole point” was that Torvald wasn’t supposed to know how ill he was nor how Nora acquired the money for the Italy trip. She says she tried to convince him to go without revealing the gravity of his illness, but that Torvald thought she was being frivolous and refused. Mrs. Linde’s adamant condemnation of any deceit between husband and wife, no matter the circumstances, reflects society’s inflexible rules regarding marriage and gender roles. From Nora’s perspective, her deceit was justified, as it saved Torvald’s life. Her difficulty in getting Torvald to agree to the trip suggests he does not trust her intelligence and ability to make rational decisions. Mrs. Linde asks if Torvald ever found out about the money, and if Nora ever confided in him. Nora says he never found out, and that she would never say anything because Torvald is proud and would be humiliated by the thought that he owed his wife something. She explains that it would destroy their marriage. Mrs. Linde asks if she will ever tell Torvald the truth. At first, Nora says she may, but only after many years, when she is less attractive and Torvald is less in love with her. However, she cuts herself off, saying that would never happen. Nora clearly believes it is quite possible to keep living with Torvald with the secret between them, and certainly a better option than revealing the truth. The suggestion that the truth would destroy their marriage is foreboding, and the first time Nora and Torvald’s marriage seems anything less than perfectly secure. Nora asks what Mrs. Linde thinks of her now that she knows about her secret, and seems to think that Mrs. Linde’s opinion of her will have improved. Before Mrs. Linde can answer, though, Nora explains that there is something that has been worrying her. She says that she’s always been able to meet the installment deadlines for paying back the debt by saving money out of her own allowance. She was not able to take money out of the housekeeping or the children’s clothes, as both these needed to be of high quality. She explains that whenever Torvald gave her money to spend on herself, she always only spent half of what he gave her, and admits that was difficult. Nora expects Mrs. Linde to respect her more now that she knows about the money, yet Mrs. Linde’s shock at the fact that Nora lied to her husband suggests this might not be the case. Nora’s explanation of how she got the money does show that she is not as much of a “spendthrift” as the other characters seem to think, and the fact that she only took the money from her own allowance highlights a sense of self-sacrifice that shows her act of deceit was truly selfless. Nora goes on to explain that she supplemented the savings from her allowance by doing copying work at night. She says that it made her very tired but that it was nonetheless fun to work and earn money and that it was “almost like being a man.” Mrs. Linde asks how much Nora has been able to pay off and Nora admits that she’s not sure; she has simply focused on paying the installments when she needs to. She then tells Mrs. Linde that she would daydream about inheriting the fortune of a rich old man who was in love with her. Mrs. Linde, confused, asks who the man is, and Nora explains it is only a fantasy. She goes on to say that she doesn’t bother thinking about a rich old man anymore as her troubles have ended. She talks about how wonderful it would be to be carefree and only have to think about doing things for Torvald and enjoying her time with the children. Nora has mixed feelings about her decision to borrow money. On the one hand, she tells Mrs. Linde about how much she has suffered and the stress of finding secret ways of paying it back; on the other, she is very proud of her own resourcefulness and enjoys earning her own money. She seems to envy the independence that men have. The fact that she doesn’t know how much she has paid off, as well as her dream about the rich old man, show that she is not dealing with the debt in an entirely responsible way. Her description of what she hopes her life will soon be like shows that at this point, what she wants most is to carry out her duties as a wife and mother without worry. The doorbell rings. The maid announces that it is someone to see Torvald, but that she isn’t sure whether to show him in yet as Torvald is still with Dr. Rank. Nora asks who it is, and Nils Krogstad announces himself. Mrs. Linde gasps and turns away. Nora asks in a tense murmur what Krogstad wants with Torvald. Krogstad replies that he wants to talk to Torvald about bank matters as they both work at the bank. Nora hesitates, but after Krogstad insists that he is here on routine business matters only, Nora tells him to go to Torvald’s study. Both Mrs. Linde and Nora have strange and suspicious reactions to Krogstad’s arrival. Thus when Krogstad claims he is here on “routine” business matters, we are inclined to believe there is more to the story. Mrs. Linde asks Nora who it was at the door. Nora replied that it was Krogstad. Mrs. Linde reveals that she used to know Krogstad many years before and says he’s changed a lot since then. Nora explains that his marriage wasn’t happy, that his wife has died and that he has many children. Mrs. Linde asks Nora if it’s true that Krogstad does business “on the side.” Nora answers vaguely, saying she doesn’t know and that they should change the subject. There are several parallels between Krogstad and Mrs. Linde. Both had unhappy marriages, which have now ended after the death of their partner. Additionally, both have been visibly changed by their past. Nora’s vagueness about Krogstad’s side business dealings shows she is not ready to tell Mrs. Linde everything yet. Dr. Rank and Mrs. Linde’s conversation reveals tensions to do with class and gender between them. Like Nora, Dr. Rank believes that Mrs. Linde should be taking a holiday. They fail to realize that it is necessary for her to work in order to survive, a situation women were not supposed to find themselves in. Nora, breaking the tension, says that Dr. Rank is as keen to live as anybody. Dr. Rank says yes, that he, along with all his patients, wish to “let things drag on as long as possible,” even if they are miserable. He notes that one example of someone who thinks like this is the man with Torvald. Nora asks what he means and Dr. Rank replies that it is a man called Krogstad who is “rotten to the core,” and that Nora wouldn’t know him. Nora asks what he is talking to Torvald about, and Dr. Rank replies that it was something to do with the bank. Nora says she didn’t know that Krogstad worked at the bank, and Dr. Rank says that there is a phenomenon of finding people who are morally corrupt and giving them decent jobs in order to keep an eye on them. Dr. Rank’s speech about life and “letting things drag on” foreshadows his eventual death. His description of Krogstad reveals society’s harsh judgment of Krogstad—that he is completely “rotten” and that he does not deserve to have a decent job. Nora, meanwhile, pretends to not really know who Krogstad is, which further reveals the extent of her deceit. Nora suddenly bursts out laughing and Dr. Rank inquires what she laughing about, asking if she knows what society is. Nora replies that she was laughing about something entirely different, and asks if everyone who works at the bank is now under Torvald’s control. Dr. Rank, shocked, asks if that is what Nora is laughing about. Nora, smiling, tells Dr. Rank not to mind, but keeps talking happily to herself about how amusing it is that Torvald has power over so many people. Nora’s behavior here is rather childish; while Dr. Rank and Mrs. Linde are having a serious conversation, she bursts out laughing at her own thoughts. Dr. Rank responds by asking her patronizingly if she knows what society is, showing he, like the other characters, does not really respect her. Nora offers Dr. Rank a macaroon. He says he thought they were forbidden in Nora’s house. Nora lies that Mrs. Linde gave them to her, and when Mrs. Linde acts surprised, Nora quickly assures her that it’s all right because she wasn’t to know that Torvald banned them. Nora eats a macaroon and walks happily around the room, saying there’s one thing she’d like to do at that moment. She says it’s something she’d like to say to Torvald, something “not very nice.” After probing from Mrs. Linde and Dr. Rank, she reveals that she would like to say “damn.” Both Mrs. Linde and Dr. Rank are extremely shocked. The macaroons are a symbol of Torvald’s strictness and Nora’s disobedience and deceit. The fact that Torvald has banned Nora from eating them in the first place shows that he thinks of her like a child, not capable of making good decisions and in need of an external presence to moderate her behavior. Nora’s desire to say “damn” suggests she wants the freedom to disobey both Torvald and the rules of society. Torvald enters and Nora quickly hides the macaroons. Nora asks if Torvald “got rid of” Krogstad, and Torvald replies that yes, Krogstad has left. Nora introduces Torvald to Mrs. Linde and says that Mrs. Linde has come all the way to town to talk to Torvald. Mrs. Linde, embarrassed, tries to explain that that wasn’t exactly true, but Nora interrupts her to say that Mrs. Linde would like a job, and that having heard Torvald had been made Bank Manager set off straight away. Nora asks if Torvald will give her a job, and, after checking that she is a widow and that she has business experience, Torvald says it is likely he can find something. Mrs. Linde thanks him. When Nora hides the macaroons it is clear that she is not as daring around Torvald as she would like to be. Nora introduces Mrs. Linde to Torvald in her usual blunt, childlike way, causing Mrs. Linde to feel embarrassed. The fact that Torvald checks if Mrs. Linde is a widow reminds us that only unmarried or widowed women are allowed the independence of being able to work in an office. Nora is clearly a very loving and devoted mother, which is a big contrast to Torvald’s attitude towards the children. His belief that their presence makes the house “unbearable” shows that his role as a father does not carry the expectation of showing any love or affection to his children. Nora talks to her children, who tell her what they’ve been doing outside. The nursemaid offers to take the children’s coats and hats off but Nora says she will do it, throwing the garments on the floor. Her children all talk at once to her. They play hide and seek; Nora hides under the table and pretends to frighten the children. Nora’s joy in playing with the children show that she is both a loving and devoted mother and that she is still somewhat childlike herself. The door half opens. Krogstad stands in the doorway, waiting. Eventually he announces himself. Nora jumps up, startled, and asks what he wants. He says that someone left the door open to the house by accident. She tells him Torvald isn’t home. Krogstad replies that he wants to talk to Nora. Nora tells her children to go to the nursemaid, and assures them that the “strange man” won’t do anything to her. Once the children are gone, she asks what Krogstad wants, as it is not the first of the month. He replies that it is Christmas Eve, and it depends on Nora what kind of Christmas she has. Krogstad’s ominous, threatening presence is a stark contrast to the carefree delight of Nora and the children playing. This contrast shows the pervasive presence of Nora’s secret and the negative effect that it could have on her life, even as she does not seem to know it. Nora’s happy, childlike manner changes instantly as soon as she is talking to Krogstad; she becomes far more cold and serious. Krogstad says that he saw Torvald walking down the street earlier with a lady. Nora asks if the lady was Mrs. Linde; Krogstad says it was, and explains that he used to know her. Nora says that she knew that, and Krogstad replies: “Oh, so you know all about it.” He asks if Torvald is giving Mrs. Linde a job at the bank. At first Nora is offended, asking how dare Krogstad interrogate her, given that he is one of Torvald’s subordinates. Eventually, however, she reveals that Torvald is indeed giving Mrs. Linde a job. She boasts that she influenced the decision, arguing that just because she is a woman doesn’t mean that she doesn’t have influence. There is some irony in the fact that Nora expects Krogstad to treat her with respect as she is above him in terms of class, while also telling him that just because she is a woman doesn’t mean she is incapable of having influence. After all, there is a parallel between the two of them, as they are both subordinate to Torvald, and have been denied power by society. Krogstad asks in a more polite tone if Nora will use her influence to his advantage. He explains that he needs Nora’s help to keep his job at the bank. Nora, confused, asks who wants to take it from him. Krogstad, thinking she is playing ignorance, implies he is aware that Mrs. Linde is getting his job and says that he therefore knows who to thank for the fact that he is being fired. He asks Nora to use her influence to stop the whole thing happening. Nora insists that she has no influence. Krogstad points out that she just claimed to have influence, to which Nora replies that she didn’t mean it and that she of course doesn’t have influence over her husband. This is the second time in a day that Nora has been asked to use her influence with Torvald in order to secure someone a job at the bank, showing the importance of the bank as a symbol of money, security and respectability in the lives of the characters. Her contradictory statements about whether or not she has “influence” highlight the ambiguous status of married women at the time; even Nora is not sure to what extent she can affect Torvald’s decisions. Krogstad says he knew Torvald in their student days and is sure he is no more “steadfast” than other married men. Nora, outraged, tells Krogstad he must leave if he talks disrespectfully of Torvald. Krogstad remarks that she has courage, and Nora replies that she’s not frightened of him anymore, as after New Year the whole “business” between them will be over. Krogstad says he will fight with his life for his job, but explains that it is not for the money. He tells Nora that a few years ago he got mixed up in “a bit of trouble.” He says although he didn’t get in legal trouble it has made it difficult to get a job, and therefore he has been forced to do business on the side, like lending money to Nora. He explains that the job at the bank was the first step on the ladder of respectability, and that by firing him Torvald is kicking him off that ladder. Several characters in A Doll’s House espouse the idea that a husband’s job is to be “steadfast” in providing reason and keeping control of his wife’s irrational whims. The suggestion that Torvald isn’t “steadfast” is even taken as a terrible insult by Nora. Krogstad’s story about the trouble he got into and his subsequent struggle to regain respectability shows the importance within society of having a decent job. This is also the first time that the other major example of deceit, the fraud committed by Krogstad, is introduced to the play. Nora says she cannot help Krogstad; he insists that this is only because she doesn’t want to, and that he has a way of forcing her. Nora, shocked, asks if he would tell Torvald about the debt. Krogstad suggests that he might, and Nora begins to cry, saying that the secret is her “pride and joy” and that it would be “horribly unpleasant” if Torvald heard about it from Krogstad. Krogstad asks if it would be merely unpleasant, and Nora tells him that if Torvald found out he would certainly not give Krogstad a job, but rather just pay off the rest of the money immediately. Nora’s mixed feelings about her secret are reflected in her confused reaction to the thought of Torvald finding out about it. On the one hand, she calls the secret her “pride and joy”; however, she is aware that there would be negative consequences if Torvald found out. This confusion is the result of the fact that Nora is both proud of saving Torvald’s life and worried about having gone behind his back. Krogstad remarks that either Nora doesn’t have a good memory or she doesn’t know much about business. He then recalls each step of the story of how Nora got the loan from him. He reminds Nora that he promised to find the money to lend her on the condition that she and her father signed an IOU. Nora says yes, she and her father did sign the IOU. Krogstad agrees that Nora did bring back the IOU with the two signatures and that therefore he gave her the money. But he then reminds her that it had been at a difficult time for her, when her father was very ill, shortly before he died. Krogstad then asks Nora on what date her father died, and she tells him the 29 September. Krogstad reveals that the date next to Nora’s father’s signature was 2 October, three days after he died. Krogstad says the handwriting on the date was also not Nora’s father’s, but another, familiar handwriting. He suggests that perhaps Nora’s father forgot to add a date and that someone else added the date afterwards, which he says would be acceptable, but asks her if the signature is truly her father’s. Nora replies defiantly that no, it had in fact been her who signed her father’s name. Here, Krogstad reveals that there is another layer to Nora’s deceit; not only did she lie to Torvald (and everyone else) about where the money came from—a domestic matter—but she also committed forgery, an illegal act. This increases the stakes of anyone discovering her secret. It is also significant that Nora’s act of fraud involved impersonating a man. In order to save Torvald’s life, she had to act beyond the restrictions imposed on women and even had to pretend to be a man in order to secure her loan. This highlights the powerlessness of women in society at the time. Krogstad tells Nora how dangerous it was for her to admit to signing her father’s name, and says it would have been better if she had never gone on the trip. Nora protests, saying she didn’t have a choice as Torvald’s life was on the line. Krogstad asks her if she ever realized she was committing fraud; Nora replies that it wouldn’t have mattered to her. Krogstad insists that she has no idea what she’s done. He tells her that he committed a similar offence, and that it destroyed his reputation. Nora asks if Krogstad also risked everything to save his wife’s life, but Krogstad only replies that the law doesn’t take motives into account. Nora cannot believe that the law wouldn’t make an exception for the fact that her father was dying and that Torvald could also have died. Krogstad tells her that he knows about business transactions, and that if he is “pitched out” again, Nora will be going down with him. He exits. In this passage, the central moral dilemma of the play is put forward: was Nora right to lie and commit forgery if it saved her husband’s life? Nora certainly believes that in this instance, the ends justified the means. However, as Krogstad points out, the law and the opinion of society are inflexible. At this point, Krogstad is certainly the antagonist of the play, manipulating and threatening Nora with the same unforgiving attitude of the rest of society. However, his motivation for doing so is that he has also been punished for committing fraud—showing that society’s harsh judgment causes people to turn against each other. Nora, alone, tells herself that Krogstad is just trying to scare her. The children stand in the doorway and tell her Krogstad has left. Nora urges them not to tell anyone about his visit. The children ask if she will play with them again, and Nora tells them she can’t, ushering them out of the room. Alone again, she picks up her embroidery for a moment, before throwing it back down. She calls to the maid and asks her to bring her the Christmas tree. She mutters to herself: “No, really, it’s quite impossible!” The maid brings the Christmas tree into the room, and Nora dismisses her. The web of Nora’s deceit grows larger as she asks her children to keep Krogstad’s visit a secret. The fact that she says she can’t play with the children is symbolic of the end of her carefree innocence. She is clearly working hard to convince herself that Krogstad is wrong and that she is not scared by what he has said. However, her fretful movements about the room and worried muttering to herself suggest she is actually very frightened. Nora decorates the tree, still talking to herself, saying everything Krogstad has said is nonsense and that she will do anything Torvald wants her to. Torvald enters and asks if anybody has visited the house. Nora says there hasn’t been anybody, and Torvald replies that he just saw Krogstad leaving the house. Nora says that yes, Krogstad was there for a moment, and Torvald says he can tell that Krogstad has asked Nora to put in a good word for him and pretend it was her idea. Nora admits that Torvald is right. Torvald, incredulous, asks why Nora made promises to “a person like that,” and why she lied to him. He tells her she must never do anything like it again: “Little song-birds must keep their pretty little beaks out of mischief.” He concludes that they won’t talk about it anymore. Nora feels reassured by promising herself that she will be totally obedient to Torvald. However, as soon as he enters, she lies to him. His discovery of the lie creates tension as it seems momentarily that Nora’s whole secret may unravel—however, Torvald hardly lets Nora speak, instead dominating the conversation by scolding Nora and telling her what to do. His statement that they won’t talk about the matter anymore shows he doesn’t suspect there is any more to the situation that what he knows, which creates an atmosphere of suspense. Nora continues to decorate the Christmas tree and tells Torvald she is excited for the Stenborgs’ fancy dress ball on Boxing Day. Torvald replies that he is excited to see what “surprise” Nora got for him. Nora brushes it off, saying it’s silly and that everything seems absurd and pointless. Torvald is surprised. Nora asks him if he’s busy and what papers he’s working on; Torvald replies he has been given authority to make changes in the bank’s organization and personnel over the Christmas week. Nora begins to say that that is why “poor Krogstad” is losing his job, but is interrupted by an annoyed “Hm!” from Torvald. Nora finds solace in the Christmas tree and the thought of the fancy dress ball, both symbols of innocent happiness. Torvald’s question about the “surprise” Nora has for him has a double meaning; Torvald is referring to the present Nora has got him, however another “surprise” is the impending revelation of Nora’s secret. The fact that Torvald is getting to work immediately on reorganizing the bank staff—and firing Krogstad—creates suspense. Nora strokes Torvald’s hair and says that if he weren’t so busy she’d ask him to give her advice on what her costume should be for the fancy dress ball, as no one has as good taste as him. Torvald replies that his “impulsive little woman” is asking to be rescued, and Nora says she never gets anywhere without Torvald’s help. Torvald agrees to help her. Nora in her distress retreats into the role of the beautiful and submissive wife. By assuring Torvald how helpless she is and how she depends on him for everything, she ensures that she is in his good favor. Here the parallel between Nora and Krogstad becomes unquestionably clear. Nora advocates the same lack of judgment towards Krogstad that she hopes will be applied to her. At first, Torvald seems forgiving, however his abhorrence at the fact that Krogstad was dishonest about his crime creates suspense, as Nora has done the same thing. Torvald says a man like Krogstad will forever have to lie, even to his own family, and that the worst part is the fact that “a fog of lies like that” spreads and infects children. He claims that as a lawyer he knows that most juvenile delinquents are the children of dishonest mothers. Nora asks why it is mothers in particular who have this affect. Torvald admits that fathers can have the same influence, but that it is mostly mothers. He says that Krogstad has been “poisoning” his own children for years with lies and deceit, and that he feels sick in the presence of people like that. He asks that Nora shake hands on a promise not to put in any more good words for Krogstad. At first she hesitates, but eventually shakes Torvald’s hand. Torvald’s speech is obviously terrifying to Nora, who treasures her children and her role as a wife and mother above anything. It also makes clear the extent to which deceit was seen as a poison in society at the time. It is worth noting that Torvald talks about the children of corrupt mothers in particular, even though he is referring to Krogstad, a man. This shows the extent to which the responsibility of being a good parent lay far more on women than men. Nora backs away from Torvald, saying she feels hot. Torvald gets up and says he must do some work, as well as think about Nora’s costume, before dinner. He also implies that he will wrap up some money in gold paper to hang on the Christmas tree for Nora, as she requested. After laying his hand affectionately on her head, he exits. Nora is visibly shaken from what Torvald has said and what she now imagines will happen if her secret is revealed. Torvald’s affection to her creates further suspense, as it shows how oblivious he is to the reality of the situation. Nora is terrified to the point that she even seems to be going mad. Her decision not to let the children in shows that she now believes she is a bad influence on them. Despite repeating “it’s not true,” it is clear that Nora has taken to heart what Torvald has said. Seresin, Indiana. "A Doll's House Act One." LitCharts. LitCharts LLC, 18 Sep 2013. Web. 29 Mar 2019. Seresin, Indiana. "A Doll's House Act One." LitCharts LLC, September 18, 2013. Retrieved March 29, 2019. https://www.litcharts.com/lit/a-doll-s-house/act-one.